This month’s reviews include coffees from two Indo-Pacific growing regions, the Indonesian island of Sulawesi (formerly Celebes) and Papua New Guinea. We had planned to include coffees from several other Indo-Pacific islands – Java, Bali, East Timor – but we were not able to source enough samples to justify including them. Never mind; we turned up some superb and original coffees from these two geographically proximate but quite different origins. Both, by the way, are classic specialty origins: both, for example, appeared on the first coffee menus Alfred Peet hung over his counter in his Vine Street store in 1966, the frequently-cited debut moment of the specialty coffee movement. Most coffee from both origins is produced by small-holding indigenous farmers, and both origins are capable of supplying very interesting coffees. But beyond those commonalities, the differences begin. Sulawesi is a very large island that sprawls like a four-fingered hand about mid-point in the arc of islands north of Australia that make up the vast island republic of Indonesia. Most Sulawesi coffee is produced in the mountainous region of Tana Toraja in the west-center of the island. The growers are small-holding tribal peoples, part of the colorful indigenous Torajan culture. Production in Toraja traditionally has mirrored the better-known Sumatra pattern: small-holding producers process their coffee by the “wet-hulled” method, meaning the small holders themselves “pulp” or remove coffee skins, remove the fruit residue through a simple ferment and wash procedure, partly dry the parchment coffee, then sell it to mills that remove the still moist and elastic parchment skin from the beans at a high moisture content, as high as 30%, rather than at the typical 12% prevailing elsewhere in the coffee world. The subsequent drying down to 12% is often haphazard. The result of wet-hulling plus haphazard drying is the famous “earth” notes of traditional Sumatra and Sulawesi coffees, really a mild mustiness. Thus traditional wet-hulled Sulawesi coffees resemble traditional Sumatra coffees, usually showing fruit notes overlaid by an earthy mustiness. In Sumatra producers and exporters have begun to understand how to systematize the wet-hulled method (more complete fruit-pulp removal, more systematic drying) to eliminate the “rustic” earthiness/mustiness, while still preserving a deep, uniquely pungent fruit character. (See Better and Better: Sumatras 2013). Some of this sophistication appears to have been applied to the only clearly traditional wet-hulled Sulawesi we review here, the 91-rated Ghost Town Sulawesi Toraja Mamasa, where a pleasantly dry, clay-like earth (my cupping partner Jason Sarley called it a “graham cracker” note) remained to contribute originality and complication to a chocolaty yet tart cup. Starting in 1976, a joint Japanese-Indonesian enterprise, Toarco, established itself in the Toraja region, aiming to elevate quality and replace traditional wet-hulling with the orthodox wet or washed method prevailing elsewhere in the coffee world. Toarco processes coffee grown on its own farms as well as accepting parchment coffee from small holding farmers in the region who meet certain quality criteria. Because of this range of sourcing, individual lots of Toarco coffee can vary in sensory detail, although the typical profile might be described as brighter and cleaner than traditional wet-hulled coffees while still displaying a characteristic honeyish, chocolate-and-fruit pungency. We review three Toarco coffees this month, the Propeller PT Toarco at 93, the Blueprint Tana Toraja at 92, and the Topéca Toarco Jaya at 91. The roast styles differ very slightly, but tellingly. All qualify under Specialty Coffee of America terminology as light-to-medium-roasted, but the Topéca, the lightest roasted (by a slight margin) showed the brightest acidity and most nut-like character, while the Propeller, the darkest roasted (again, by a slight margin) of the three, showed the most depth, resonance and chocolate. About 2,000 miles or so east of Sulawesi, the country of Papua New Guinea (PNG) occupies the eastern half of the vast, mountainous island of New Guinea. The extraordinarily verdant, yet dauntingly rugged mountains of central Papua New Guinea offer one of the world’s most favorable terroirs for the production of fine Arabica coffees, as well as some of the coffee world’s most intractable challenges in respect to transportation and infrastructure. The Papua New Guinea coffee industry was pioneered in the 1950s by expatriates who introduced familiar, conventional wet-processing methods that produce a cleaner, more familiar profile than produced by the Indonesian wet-hulling procedure (a method that apparently evolved out of practices introduced by the Dutch into Java as early as the 1740’s). For many years PNG coffees divided between “plantation” coffees produced by expatriate-led estates or wet mills located close to the region’s only highway, and “tribal” or small-holder coffees produced by rougher, more primitive versions of wet-processing, often in more isolated parts of the mountains from which coffees need to be carried out either by airplane or literally on the backs of the farmers. The formally wet-processed “plantation” coffees came with grade designations like AA and A, while the tribal coffees were bulked together and relegated to the opposite end of the alphabet, as grade Y. Over the past twenty years or so the situation has grown more fluid and complex, however. Some small producer coffees have improved through better organization and processing and are no longer bulked with others, while formal plantations largely have dissolved into centralized mills buying both coffee fruit and parchment coffee from small holders. If Papua New Guinea ever stabilizes its production to the point that high-end small lots are consistently selected out by variety and terroir and meticulously processed, the rest of the coffee world could well be shocked by the quality and distinction of the results. For now, we review four fine samples of the current generation of PNG coffees. 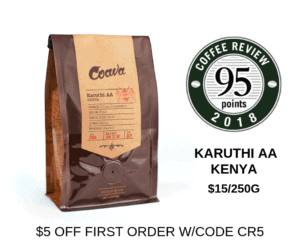 Two were produced by small-holding farmers but centrally processed – the top-rated Chromatic Coffee Papua New Guinea Kunjin (94) and the 90-rated Revel Coffee Papua New Guinea. The other two were produced on what sound like relatively small coffee estates – the PT’s Papua New Guinea Sihereni (92) and the Allegro Papua New Guinea Baroida (91). All are balanced, well-structured and distinctive in aroma and flavor. If one commonality runs through all four profiles, it is a rich, ripe citrus, pungent but enveloped in sweetness. The Chromatic Coffee PNG Kunjin version of this note was particularly deep and juicy. And lest anyone, on the basis of our slightly higher ratings for very slightly darker roasts in the case of the three Toarco Sulawesis, is tempted to conclude that we prefer roasts at the darker end of medium-light, I need to point out that our ratings trended in exactly the opposite direction with the four PNGs. The highest-rated Chromatic (94) was the lightest roasted of the four, whereas the somewhat lower-rated Allegro (91) and Revel (90) were roasted slightly darker, approaching a classic medium. The PT’s Coffee PNG Sihereni (92), a light-medium, was situated squarely between those two extremes – if they could be called extremes, given that all four coffees ranged in degree of roast from medium to light.